The month long fasting period is over and its time to celebrate Eid. Fasting for a whole month without water and carrying on with ones work and routine is not easy. Hot weather makes fasting that much more harder and I feel bad for the ones fasting in the Western countries. For them the fasting period lasts longer. During the month of Ramadhan, loads of street food is sold for Iftar, samosas, kebabs, juices, mamri, kaimatis, dates etc etc. One cannot help but get into the festive mood in Mombasa. Shops and malls are decorated, shops are busy and open till late. Delicious food is sent home by Muslim friends and tempting aromas waft through from neighbours homes. To celebrate Eid this year I decided to make Sheer Khurma. 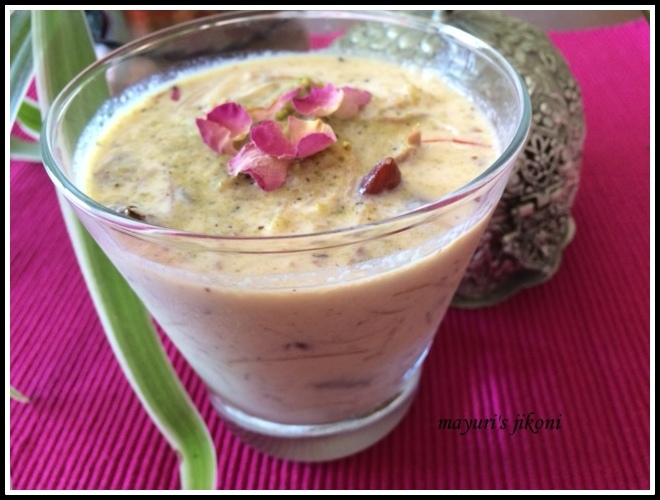 Sheer is milk and khurma is dates in the Persian language. Sheer Khurma is made as a breakfast treat on Eid and also as a dessert. Its usually served the whole day to guests.Certain ingredients may vary according to the regions but the main ingredients are milk, dates, vermicelli, sugar and nuts. Here’s wishing all fellow bloggers and friends Eid Mubarak. May the coming year be filled with happiness, peace and prosperity for you and your whole family. NB : For this long weekend hubby and I had gone away to our beach apartment. I usually get time to blog sometimes. I had kept this recipe ready to post on Eid day. However my antique computer gave up on me. I forgot the charger, and the battery life is shorter than a mayfly! So sorry for the delay in posting. Heat milk in a thick bottomed pan over medium heat. When it gets a little hot take about a tbsp of milk and put it into a small bowl. Add saffron to it. Leave it on the side till required. Take ½ cup of the hot milk and put it into a bowl. Pit the dates and chop it into big pieces. Add to the hot milk. Keep it on the side till required. When the milk comes to a boil, reduce the heat and let it simmer till its reduced a bit. Keep stirring frequently to avoid the milk from scalding at the bottom. Add ghee into a small kadai or frying pan over low heat. Roast the nuts in it till they are light golden in colour. Remove the nuts from the pan and leave on the side. Add raisins to the ghee and stir till they plump up. Remove and add to the nuts. Add the vermicelli and roast till its golden brown. Add the vermicelli to the milk. Add sugar and condensed milk. Stir the milk mixture frequently till the vermicelli is cooked. Take the pan off the heat. Add the nuts, raisins, saffron milk, date mixture, rose petals and cardamom powder. Mix well and serve hot or chilled. Add nuts of your choice. Add rose water or kewra if you like. To make it into a more richer sheer khurma, add fresh cream. If you prefer a less sweeter sheer khurma, don’t add the sugar. Sheer kurma looks absolutely delicious.. Should try this sometime..
thank you Sona, do try it, its pretty rich. Happy Eid, This is a perfect dessert for celebrations. Sheer kurma is one such dish that I can never resist and will keep on coming back in kitchen to have more and more. I don’t need a reason to make it. I don’t add condensed milk. I’m sure it must have lifted the taste. Thanks Ritu, the condensed milk just makes the thicken part quicker and yes adds a sweetish taste too.